SUMMARY: This week we bring you a video interview from the MarketingSherpa Media Center at DMA's &THEN 2015 in Boston. Read on and watch the video to discover what motivates Millennials and older generations to use their smartphones as we discuss survey results with David Berkowitz, Chief Marketing Officer, MRY. At the MarketingSherpa Media Center at DMA's &THEN 2015, Daniel Burstein, Director of Editorial Content, MarketingSherpa, sat down with David Berkowitz, Chief Marketing Officer, MRY, to discuss results of a recent study on how Millennials and older people use their smartphones, and what motivates their use. In December 2014 MRY, with Whitman Insight Strategies, conducted an online survey of 820 U.S. full-time working smartphone owners aged 21-55. MRY also conducted a series of discussion groups through MRY #YouThink, its millennial audience research panel. The researchers asked participants, "Which of the following do you consider the most important things you can use your smartphone to do? You can select up to five answer choices." Although Millennials' top motivation also was to communicate and connect with other people, in comparison to older people who used smartphones more to entertain themselves and to kill time. How can marketers use this information to send relevant messages to Millennials and older customers? 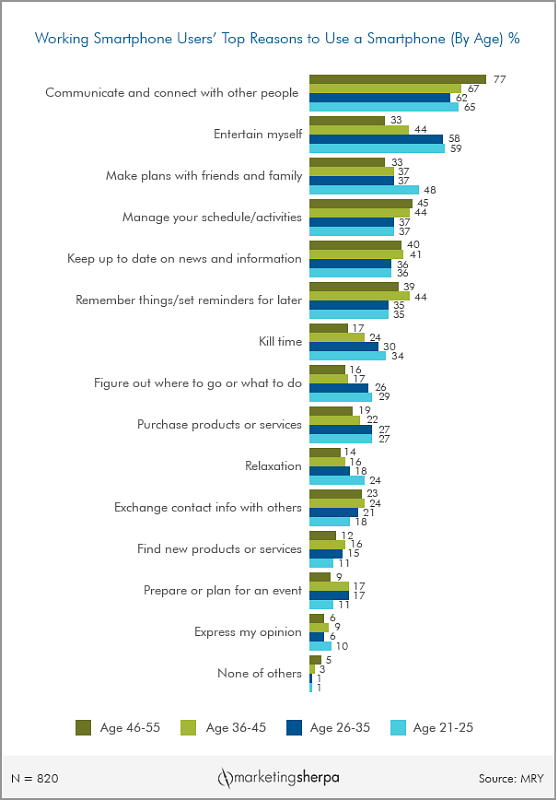 Berkowitz suggested marketers play to the utility orientation of older generations and think of ways they can proactively save their customers time or effort when they are planning to run errands. On the other hand, to play into the entertainment orientation of Millennials, Berkowitz suggested marketers send them low-commitment, bite-sized messages ("Snapchat moments") that let their customers relax and have fun. He added that, over time, the repeated rewarding interactions would build trust in the brand.